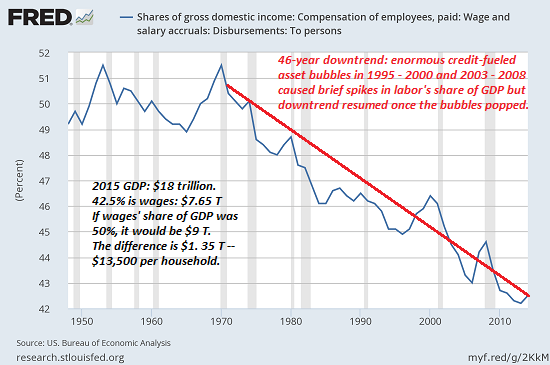 Even more devastating, wages’ share of GDP has been declining (with brief interruptions during asset bubbles) for 46 years. That means that as gross domestic product (GDP) has expanded, the gains have flowed to corporate and owners’ profits and to the state, which is delighted to collect higher taxes at every level of government, from property taxes to income taxes. Here’s a look at GDP per capita (per person) and median household income.Typically, if GDP per capita is rising, some of that flows to household incomes. 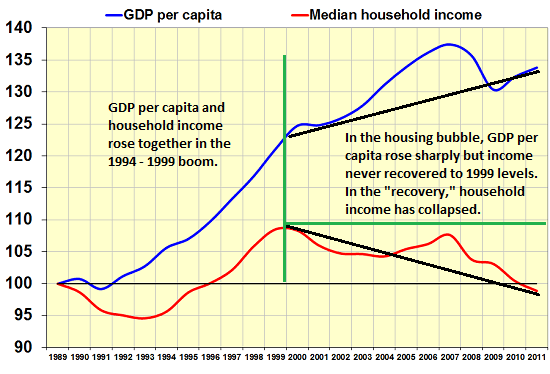 In the 1990s boom, both GDP per capita and household income rose together. Since then, GDP per capita has marched higher while household income has declined. Household income saw a slight rise in the housing bubble, but has since collapsed in the “recovery” since 2009. The sums are non-trivial as well. America’s GDP in 2015 was about $18 trillion. 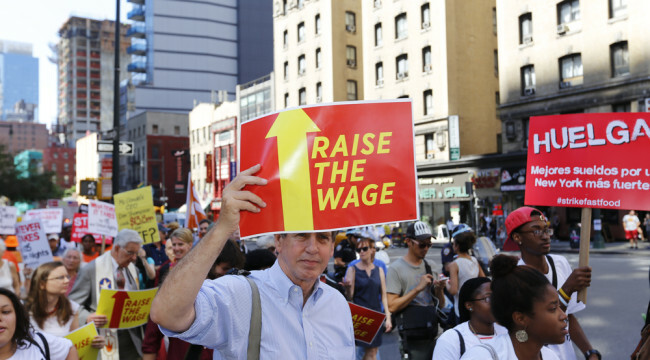 Wages’ share–about 42.5%–is $7.65 trillion. 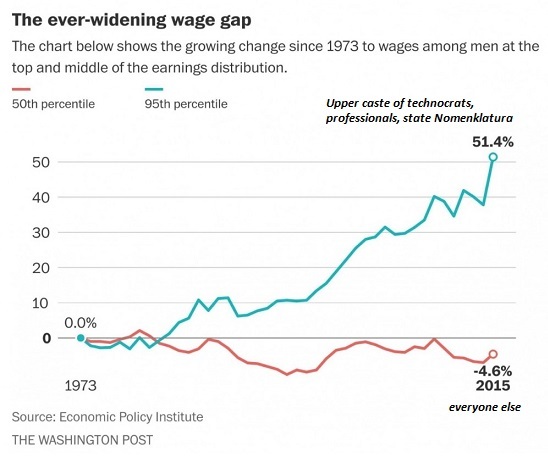 If wage’s share was 50%, as it was in the early 1970s, its share would be $9 trillion.That’s $1.35 trillion more that would be flowing to wage earners. While it’s easy to spout political promises to “fix” this secular trend, it isn’t that easy. Technology and global competition has raised the premium on technology and managerial workers and reduced the premium on most conventional jobs. Crony-state capitalism has imposed rentier monopolies and cartels on wage earners, effectively transferring more of the nation’s income and wealth to politically powerful entrenched interests and cartels. And so 95% of us will continue to get poorer, no matter who’s in office.